It is the center of the Yaeyama. The city center and the ferry port are located in the south area. Wild and rich natural such as jungles, mountains and beaches are in the north and west. What are the coasts of Yaeyama Islands like? They are covered with clear blue water where many creatures live. When you are on an air plain on a sunny day, you will get still with your eyes fastened on huge coral leafs. Generally, you can swim there from mid March to October (or later, it depends on temperatures). However be careful, in March water is still cold on a cloudy day, but on a sunny day, temperature is high enough to swim. It is said the weather become stable after around mid April, and the rainy season come in mid May and ends in June. After that from July to September, typhoon season comes. So you need to schedule your trip carefully. If you don’t hesitate, try to drive by rent-a-car so that you can go everywhere anytime you want, but if don’t like driving, bus would be better choice. Ishigaki is so small that there is no train. Main transportation is bus and taxi that cover all the land. Where to stay in Ishigaki? I recommend you stay in the city center near the port that is good access to all near islands and many good restaurants, if you travel as many islands as possible. If you want to look around all Ishigaki to enjoy the nature, suburb area could be good choice for you, but remember that there are fewer restaurants than in the city center. This light house is located in the northernmost point of the island. On a fine day you will be taken by surprise to see the colorful blue sea and the whole view of the Pacific Ocean. You need car to go there. Be careful when you park in a high season because there are only less than 10 parking lots. Must-visit place! It is located in Ibaruma area that is just in the tiny waist of the island, so you can see both the China Seas and the Pacific Ocean. Especially, the Pacific Ocean side has great scenery with coral leafs. It is a little mountain (hill), 230meters above sea level and just 10 minutes from the city center by car. You can see the neighboring islands, like Taketomi, Iriomote, Kohama, etc. This bay represents Ishigaki Island, and is one of the must-see places. Though it rains with dark and thick clouds, the water keeps its blue. In this bay you can see some boats floating. You can ride on it and see coral leafs below through the glasses in the boat floor. On a fine day when the water gets more clear and beautiful, the boats look as if they are floating in the air off the surface of water. It is in the western end of the island where the beautiful sunset is seen. Ishigaki is well known to divers all over the world. You are not good at swimming? Don’t worry! You can enjoy snorkeling. There are many agencies who organize snorkeling and diving tour. They take you to on boat to the highlight area in the sea and you can enjoy swimming. If you cannot swim, they guide you with a life buoy. Why don’t you find a Nemo from “Finding Nemo” Tropical fish and Manta ray are just there in front of you! The famous coral leafs in Ishigaki is called “Sekisei-Shoko”, which is the biggest lagoon in Japan and well-kept by the government as a national park. If you want to see Manta ray, western area is for you. The links below are agencies who organize snorkeling and diving tours. It is from only 20 minutes south from the airport. The coastal view is not that beautiful, but there are big coral reefs off the shore. Great place for snorkeling and diving. As mentioned before, the Japan’s biggest lagoon is located between the Ishigaki and the Iriomote. Its size is 20km from the west to the east, 15km from north-south. It has more than 400 species of corals. There are many beaches in Ishigaki, but here are the best beaches. You can enjoy snorkeling without going offshore. The beach is near Kabira Bay and water is transparent and astonishing. In the north there are huge beaches but unfortunately most beaches are hidden behind bushes and has few access. Akashi Beach is the lucky one with access through the bushes, just near Akashi Shokudo (restaurant) that is said “The restaurant where you can eat the most delicious soba in the island”. Here are typical and popular foods in Ishigaki and some dishes are also familiar in Okinawa. 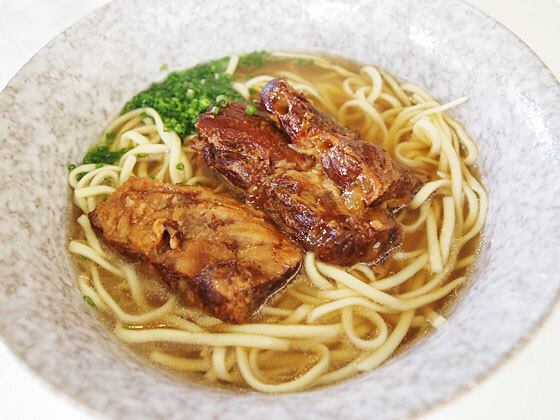 As the name says, it is typical noodles in Yaeyama Islands. You can find pieces of pork meat simmered in soy sauce and ground fish on noodles. Add pepper called Pipaatsu if you like. This soba restaurant is very famous and it is said “the place where you can eat the most delicious soba”. Many people come to Ishigaki north just to eat there. This is a type of seaweed and is grape-like shaped. Once you eat it, it feels popping and go well with soy sauce. There are many yakiniku (grilled meat) restaurants and small lunch counter in the city center. I recommend Ishigaki beef Sushi! Meat melts in mouth softly. Better to have it with rock salt that gives you rich flavor. In many sushi bars you can find. Ishigaki is rich with seafoods. Rice balls that contains Spam meat and sometimes eggs. You can find them in a lunch corner or corner stores. It is typical dish in Okinawa Mainland. Ingredients of tacos are on rice with chili sauce. Orion beer is known for Okinawa’s brand. Awamori is special liquor of Okinawa prefecture with more than 30% alcohol. In Ishigaki the brands like Seifuku and Kuroshinju are famous. 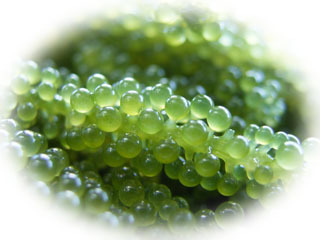 In Hateruma, the Awanami is famous and hard to get for few production. Everywhere you go you will find shiisaa statues on rooftops in Okinawa and Yaeyama islands. Shiisaa is said to chase away evil spirits. Nowadays you can find lovely and impish faced ones in souvenir shops. You can find mobile phone cases, T-shirts, towels etc. with Orion beer design. Also you can buy Awamori-logo-printed T-shirts. In Japan Nestlé provides various Kit Kat exclusive for Japan. In Kyushu and Okinawa, you can find Beniimo (purple sweet potato) Kit Kat. You should not forget to go to other islands when you are in Ishigaki. Just 15 minutes from Ishigaki. Ferry departs every 30 minutes. Anei Kanko (a ferry company) offers combined ticket of rental bicycle and ferry. This island is the southmost manned. 1 hour from Ishigaki by ferry and 3 or 4 ferries a day. They go through the course where ocean current is very rapid, so ferries are frequently canceled when waves are more than 2.5 meters high. That’s why many travelers hesitate to go to Hateruma, but if you have enough time you should try! The sea water is incredibly beautiful and called “Hateruma Blue”. At night you can look up the sky filled with countless shining stars. The best place to disconnect yourself from the noisy city life. To go around the island, you need to borrow a bicycle. Most inns offer rental bicycles and snorkeling equipment. Electric powered bicycle: 1 day 2,000 yen, 4 hours 1,500 yen. Bicycle: 1 day 3000 yen, 4 hours 2000 yen. Iriomote has wild cats indigenous to this island and wild jungle that covers the major land where you can enjoy jungle cruising. Of course, there are several beautiful coral coasts; some are famous such as Hoshizuna Beach, Dudumari Beach and Nakano Beach, and others are in hidden places. Why don’t you find your private beach? Ferry from Ishigaki has two routes: one to the Uehara Port and the other one to the Ohara Port. The Uehara port has good access to the famous beaches but one disadvantage, too. The Uehara route passes through the course where sea current is rapid, so frequently ferries are canceled. On the other hand, the Ohara route is stable and rarely canceled. By the way, if you stay in a hotel, most hotels come to the both ports to pick you up. And then you can reserve jungle cruising and an agency comes to your hotel for pick-up, too.